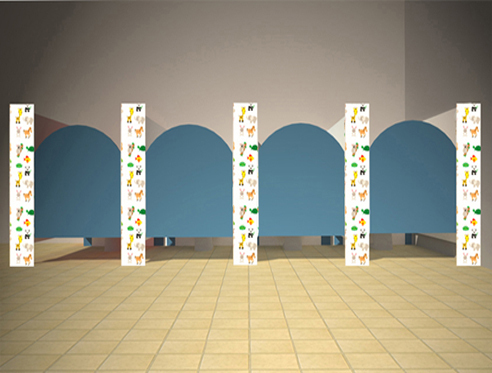 The Lillia range is our latest set of cubicles for pre-school and nursery children. Lillia is a frameless set of cubicles which uses existing materials used in other ranges but innovates to create a more user-friendly and exciting environment for children. Built on solid and stable legs the Lillia range eliminates the need for a headrail, this makes installation much easier and gives us more ways to design and place cubicles to suit children. This cubicle system adds brand new design concept to our range using the latest innovative print technology. The technology allows us to add high quality images to the curved aluminium. The most unique feature about this range is that it allows the end user (the children) to be involved in providing an extra dimension to the to the finished product. The leg has been designed to eliminate the need for a headrail. Pull to open door allowing safe access. Eye catching bold primary colours. A cubicle that is stable, solid and strong. The hinges on the Lillia range are strong and safe. Incorporating an anti finger trap design to provide a safe environment for children. Brackets supplied in packs of three - one red, one blue and one yellow - complete with matching fixings and bush bolts. Features a bright yellow coloured radius faceplate and an emergency release mechanism with colour co-ordinated knob and shoot bolt. The indicator bolt also comes with the option of a fun clown faceplate with smiley face. The brightly coloured red and blue slim line support provides height adjustment to accommodate commonly found falling floors. The floor fixings are concealed well away from inquisitive children. Bright yellow sprung loaded roller, which is supplied for face fix or through fix, completes the finishing touch to the bright cubicle.